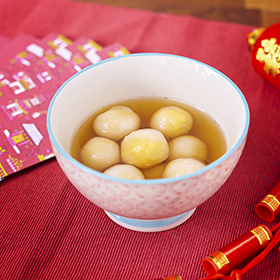 Soak the Chinese mushroom and dried shrimp in hot water until softened, then dice them into pieces. Set aside. Dice the shallots, meat sausages and abalone. Set aside. Peel the turnip; cut half of the turnip into strips and grate the half of the turnip into shreds. Mix the corn starch with rice flour, and add the salt, sugar, ground white pepper and chicken powder together. Add the water (200ml) to soak the dried shrimps and Chinese mushroom to the flour mixture and mix well. Stir-fly the XO sauce and meat sausages without adding oil, then add diced shallots, Chinese mushrooms, dried shrimps and abalones. Stir-fly for a while until the aroma comes out and set them aside. Cook the turnip for around 5 to 10 minutes until some of the water is oozed out. Mix the remaining ingredients and the flour mixture with the turnip, and then pour it into a container or an aluminum tray. Steam the turnip cake for around one hour over medium heat. Ready to serve. Mix flour, custard powder, sugar and salt well. Add egg yolks and milk. Mix well. Cook the batter over low heat. Keep stirring until a dough is formed. Remove from heat. Add the butter into the dough and mix well. Place the dough in fridge. Set aside. Add hot water to tapioca starch. Mix well and knead into a dough. Place the dough in fridge. Set aside. Divide the custard filling into 30 portions and roll them into little balls. Place the balls in fridge and chill at 0ºC until they are frozen. Wrap the frozen custard filling in the dough and roll them into balls. Cook the dumplings in boiling water for 5 min. Turn off the heat and let the residual heat inside to cook for another 5 min. Cook gingers and slab sugar in boiling water. Add dumplings. Serve. 1. 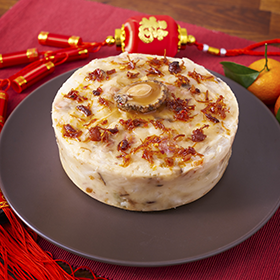 Customers whose net spending reach $688 online at PARKnSHOP.com or PARKnSHOP APP can enjoy free LEE KUM KEE PREMIUM XO SAUCE W/ABALONE (#150849) by inputting designated eCoupon code “PNSDCG” during checkout. 2. The offer is only valid for orders placed from 1 Jan – 14 Feb 2019 (both days inclusive). 3. The offer cannot be redeemed for cash, other product or privileges. 4. The offer will be awarded based on net purchase of each transaction after discount. Transactions cannot be accumulated for the promotion. 5. The offer is not transferable and cannot be used in conjunction with other discounts and promotional offers. 6. This offer and is not applicable to orders made via phone or fax. 7. This offer and is not applicable to the purchase of AquaBlue Tru Niagen products, PNS Plus items, hairy crabs, phone cards, hampers, WATSONS Wats-Mini S Hot & Ambient Dispenser, stage 1 infant milk formula, home appliances and cookware in PARKnSHOP.com, Karuizawa products, tobacco, spirits, Tung Fong Hung products, bird’s nest, essence of chicken, abalone and any other redemption products. 8. Each delivery address and account is entitled to the offer only once during the promotion period. 9. Free Gifts are in limited supply and available while stocks last. 10. If there is any inconsistency or conflict between the English and the Chinese version of the terms and conditions, the English version shall prevail. 11. In the event of any disputes, the decision of PARKnSHOP (HK) Limited shall be final and conclusive. Back to "Merry Year of the Pig"